You know those caramel/peanut-coated apples they usually sell in the fall around Halloween and the chocolate/peanut ones that start getting big around Christmas? Here’s a Paleo version, but using almonds or other nuts instead of the peanuts, and strawberries for a Valentines Day theme. If you need any more persuasion, consider that strawberries are smaller than apples, which means that each individual strawberry has a greater surface area relative to its mass, which means more chocolate for you! Chocolate is always one of those borderline-Paleo foods that some people include and other people don’t. If you’re going to have some, go as dark as you can to keep the sugar/general junk content as low as possible (if you dare, you can actually buy 99% dark chocolate in most grocery stores). And don’t forget to get one that was ethically sourced; child labor isn’t much of a Valentine’s Day treat for anyone. Even if you go for something less than 99%, a homemade treat like this is definitely healthier than a lot of other junk you could be eating on Valentine’s Day, and there has to be room in a Paleo approach for some treats, otherwise it’s just not realistically sustainable. If you don’t actually want anything special, that’s totally fine, but if you do, these are an option that can fit into a Paleo approach to nutrition…and they taste pretty darn good, too! SERVES: 4 PREP: 5 min. COOK: 5 min. Heat about 2 inches of water in a double boiler, and melt the dark chocolate pieces until smooth. Add a pinch of sea salt to the chocolate and give it a good stir. Place the chopped almonds in a bowl. 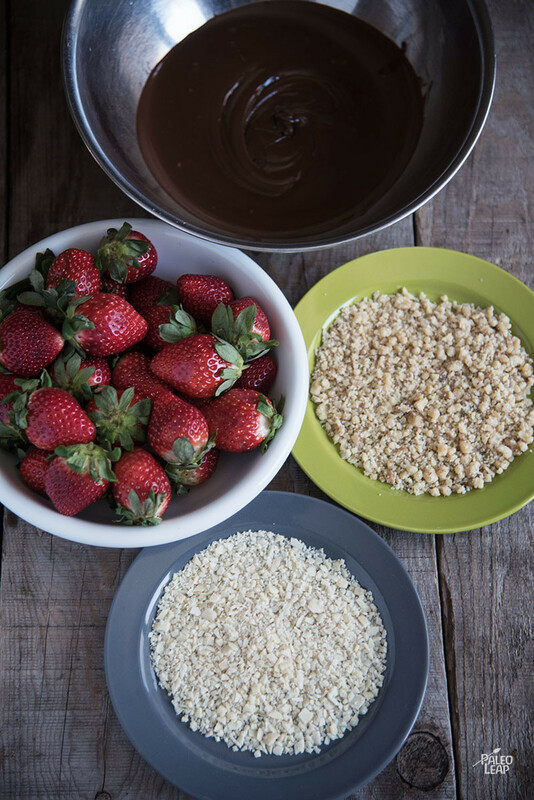 Dip each strawberry in the chocolate, letting the excess fall back into the bowl. 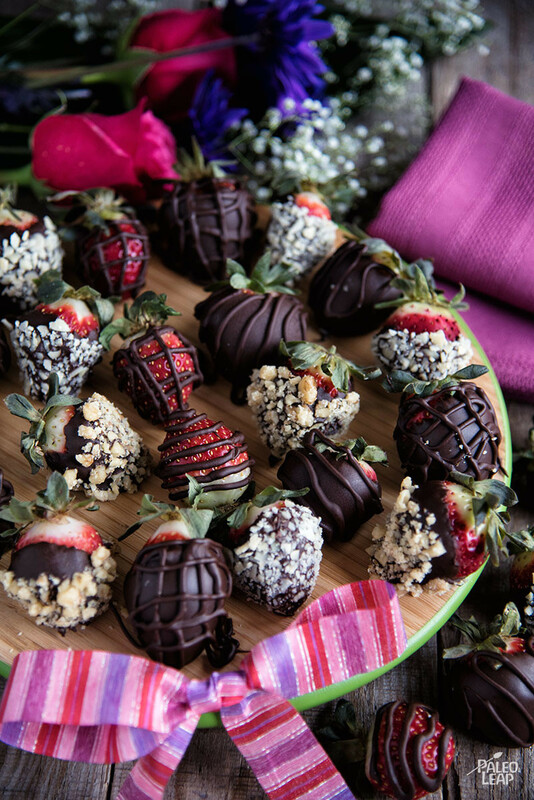 Immediately dip the chocolate covered strawberries into the chopped almonds. Place the chocolate covered strawberries onto the prepared baking sheet. Drizzle the leftover chocolate over them, and let sit until set.